Stupendous and off the deep end but genre fans will want to roll with it. 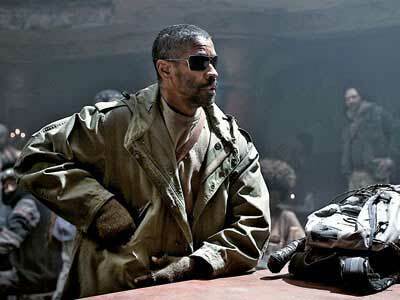 The Book of Eli is post-apocalyptic sci-fi with a drifting hero (with an undisclosed purpose) travelling west, and he is embodied by none other than Denzel Washington as the title character. This is a violent and graphic film, with gray skies and brown deserts, desaturated from realistic colors to the point that some of the visuals look black & white (maybe brown & white, a first). 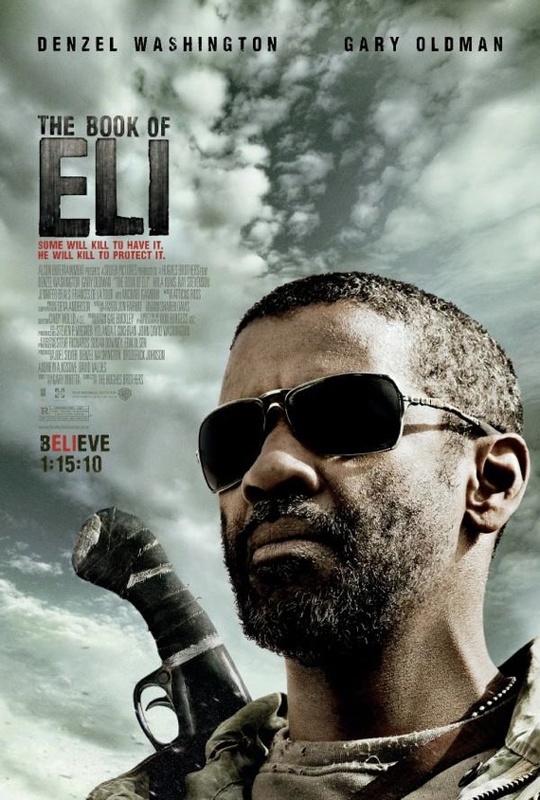 In an early deadly encounter as Eli faces off some homicidal scavengers underneath a bridge, it is filmed in high contrast so the actors are pitch-black while the desolate landscape serves as the backdrop. Interesting how much more involving this opening action scene are in comparison to other movies of this nature. This probably has to do with a steady and fixed camera where you can appreciate the elaborate choreography taking place before your eyes. There are less choppy and chaotic editing techniques than usual for this kind of genre film. This is the fifth film by the Hughes Brothers (“Menace II Society,” “From Hell”) who if anything depend upon a regimented style. But enough about them, let’s go onto the story. As if it was the old west once again, Eli stumbles into a town to do some trades and leave. It is amusing that in the future, KFC wet napkin packets carry a certain commodity value. Eli enters the local pub to get some water — bad decision — and soon enough Carnegie (Gary Oldman), the lord of the town, wants Eli to join his side and work for him. Eli just wants to head for the road, but Carnegie wants to detain him. The sultry-cute barmaid, Solara (Mila Kunis, with improbably perfect skin) wants to accompany him. The story structure gets routine – one band of baddies chase the good guys down in the desert that leads to a wild west shoot-out, only with high-tech guns at play. The movie deserves a nod for creating a shoot-out that is technically unique, with the camera doing an unbroken, virtual figure-8 camera loop-around. Oldman makes Carnegie a man who you once believed was good until he lost his sanity and corrupted himself with lordly power. He is a literate and cultivated man in contrast to a wasteland of degenerates. This is not to take away anything from Washington who is terrific as this saintly, baddass and a self-appointed apostle. An apostle with a gun, he is. Maybe Eli becomes something more than an apostle though, it’s up for debate. The conclusion is more transcendent territory than the usual post-apocalyptic movie. This is a surprise for a movie coming out in January, where studios unleash their dogs. But you still have to chew on some preposterous stuff. Such as, why do roughnecks with only pipes and hacksaws approach Eli without reluctance, who clearly has a gun? Why does Solara recite a prayern at a conveniently opportune moment to twist the plot? And what’s with that laughable final twist, revealed in ultra-tight close-up that zooms up on Eli’s face that is anything but gratuitous? Still, genre fans are going to eat this up and appreciate its evocative visual style as well as for the reflective religious elements. 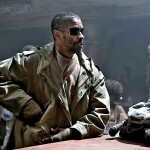 It is uncommon for an action movie to depend crucially on adversaries vying for scripture of the Gospel. The script by Gary Whitta makes a good case that the Bible could be the greatest book ever written due to solely its instrumental language. Audiences looking for plot holes will find “Book of Eli” littered with them, and they will find it to be a crock. But the movie has some bold ideas and has some exciting action. Film Cousins: “The Boy and His Dog” (1976); “The Road Warrior” (1982); “Mad Max Beyond Thunderdome” (1985); “The Postman” (1997).